Students at Innovation Central High School are helping classmates and their own families beat hunger. 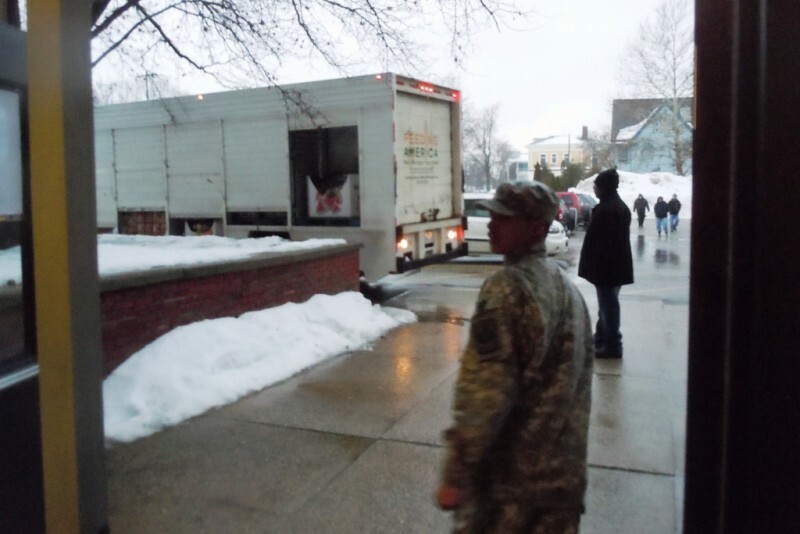 A hard, cold rain was falling as the Mobile Food Pantry pulled up to Innovation Central High School on a Thursday evening in February. Sergeant James Peterson stood in the weather for a few minutes before deciding to move the food inside. 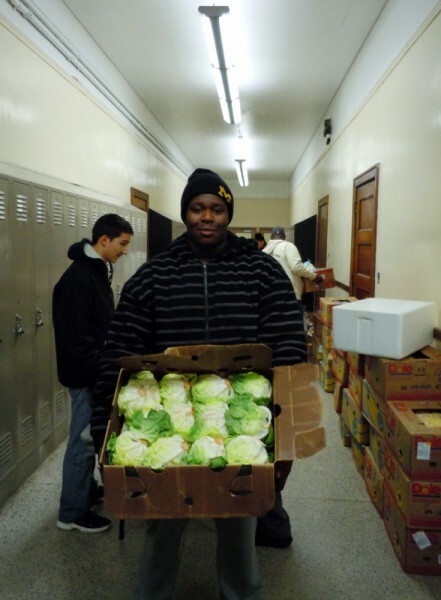 Half a dozen students, all members of Central’s Junior Reserve Officers’ Training Corps, got to work hauling skids of bread and boxes of lettuce off the truck and into the school. Last year, several local foundations provided funding for Feeding America West Michigan Food Bank to start Mobile Pantry programs at Grand Rapids Public Schools. Central’s participation, said Principal Mark Frost, is a credit to the JROTC, who put in several hours each month to staff the distributions. JROTC cadets can earn promotions if they meet their community service goals. One of the cadets helping that night was Clarence, an 11th-grade student and varsity football player who wore a University of Michigan hat and a Superman sweatband on his wrist. Clarence hopes to go to college through the Corps, which would give him the opportunity to join the Army as a second lieutenant after graduation. “My family is military, so I’m military,” he said. The food Clarence and his fellow cadets distributed that night was enough to provide half a week’s worth of food for more than 100 households. The school has hosted five Mobile Pantries so far, and Clarence has volunteered at all but one. “He’s always willing to help,” Peterson said. Many of the cadets in Peterson’s corps are in need of the same food assistance they’re working to provide, but he didn’t count Clarence among them. Clarence himself told a different story. “I am that person that would come to get food,” he said. When school lets out for the summer — a time when many families struggle with food insecurity — Clarence and his mom will sometimes collect food at Feeding America West Michigan’s Mobile Pantries. With 86 percent of its students qualifying for free or reduced-price meals, GRPS joined a federal pilot program in 2012 to provide breakfast and lunch to all students. In Kent County at large, 18.6 percent of children are food insecure. Principal Frost said that the Mobile Pantry program ensures that his students have access to nutritious food at home as well as at school. Feeding America West Michigan is seeking additional sponsors to keep the program going through the end of the year.